In the waning days of Venice’s glory in the mid-1700s, Andrea Memmo was scion to one the city’s oldest patrician families. 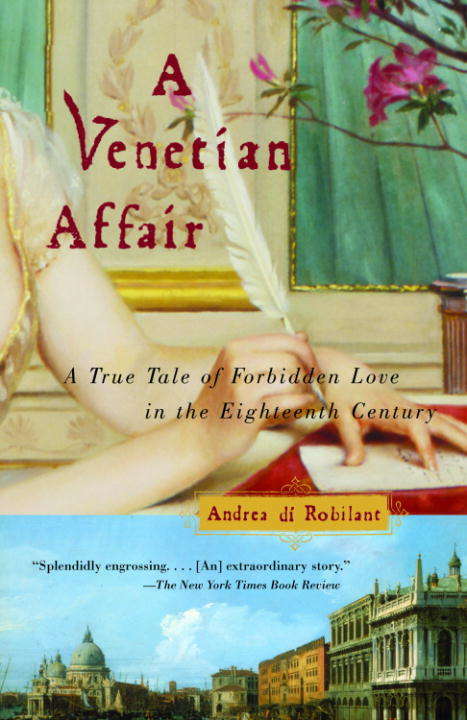 At the age of twenty-four he fell passionately in love with sixteen-year-old Giustiniana Wynne, the beautiful, illegitimate daughter of a Venetian mother and British father. Because of their dramatically different positions in society, they could not marry. And Giustiniana’s mother, afraid that an affair would ruin her daughter’s chances to form a more suitable union, forbade them to see each other. Her prohibition only fueled their desire and so began their torrid, secret seven-year-affair, enlisting the aid of a few intimates and servants (willing to risk their own positions) to shuttle love letters back and forth and to help facilitate their clandestine meetings. Eventually, Giustiniana found herself pregnant and she turned for help to the infamous Casanova–himself infatuated with her. Two and half centuries later, the unbelievable story of this star-crossed couple is told in a breathtaking narrative, re-created in part from the passionate, clandestine letters Andrea and Giustiniana wrote to each other.